We’re almost at the end of 2014, and can safely say that 2014 was a good year in gaming. There were a few surprises, some pretty big duds and we saw the Xbox One and PlayStation 4 finally come into their element with some great releases. 2015, however, looks far better compared to 2014 for gaming, with long awaited AAA titles releasing on pretty much every platform. We’ll be covering the top 10 upcoming games of 2015 on both the Xbox One and PlayStation 4 as well in the coming days, so watch this space. While there’s a lot of games announced for 2015, only a few have a solid release date so we’ve mostly refrained from picking games that have only been announced. But the few here without a concrete release date are just too exciting not to mention. So here’s our picks for the 10 best upcoming PC games of 2015! The third installment in the immensely popular Witcher franchise is all set to release on February 24, 2015. This highly ambitious title claims to have the largest open world in modern RPG history, and has been in development for over 4 years. Wild Hunt will be the concluding chapter chronicling the saga of series protagonist Geralt of Rivia, and continues from the story of its predecessor. Highlights include adaptive AI, dynamic environments and a realistic day and night cycle which will affect the world and its inhabitants, of which there are far more than in the earlier games. CD Projekt RED, the Polish developer behind the release says that the game will take over 100 hours to complete, and from what we’ve seen, it looks nothing short of breathtaking. Definitely a must play for RPG fans! Update: The game has been delayed to May 19, 2015. From Polish developer Techland comes Dying Light, an action game with survival horror elements featuring, you guessed it, zombies! Techland is widely known for the Dead Island series, which also had a similar premise. In fact, it apparently started out as a Dead Island sequel, but was made into a completely new game because of all the new features. Dying Light will incorporate a day-night cycle crucial to gameplay, and also features parkour. The day-night cycle feature in the game is very interesting and quite unlike other zombie games. By day you’re supposed to scavenge for resources and set traps since the zombies are slow and can be spotted easily, but by night it’s a whole new ballgame because the zombies become far more aware, can sprint, have increased damage and have ‘parkour’ skills similar to yours. It’s bloody, fast paced and looks great, what’s there not to like? Evolve is a cooperative/squad based shooter videogame published by 2K Games and developed by Turtle Rock Studios, known for developing Left 4 Dead 2 DLCs. The idea of the game is very cool, 4 players are pitted against 1 monster controlled by a 5th player, and the objective is to eliminate each other. What’s really interesting is how the monster can consume smaller AI controlled creatures to evolve and get stronger, while the 4 players have their own unique abilities. There’s different kinds of monsters as well, although as of now only 2 types have been revealed. It’s set to release on February 10, 2015 and will feature free DLCs for all players, which is a fantastic move on the developer’s part. Evolve is built on the 4th generation of CryEngine, so you can bet it looks amazing too. Grand Theft Auto V released on the Xbox 360 and PlayStation 3 last year, but it’s still one of the most anticipated games of 2015. It’s a direct sequel to Grand Theft Auto IV, and is set to release on PC on January 27, 2015. Just like the Xbox One and PlayStation 4 versions released on November 18, 2014, the PC version will feature updated visuals and a brand new first person mode which pretty much changes the whole game. Grand Theft Auto V follows three protagonists, unlike the previous installments of the series, and features an even larger world with a wealth of story and side missions. Review scores have been nothing short of stellar, and the game has won several Game of the Year awards already. PC gamers will obviously get the best visual fidelity and modding capabilities, so calling this a must play is an understatement! If there’s one thing the Battlefield series is known for, it’s huge open battlegrounds in an army/special forces setting. That’s all set to change with the next installment in the long running Battlefield franchise, dubbed Hardline. It’s the first in the series to focus on cops and robbers, so to speak, and will see players take part in the ‘war on crime’. The single player campaign will follow Nick Mendoza, a SWAT officer involved in criminal activity, and features multiple ways to complete objectives, either by stealth or the slam-bang route. Multiplayer has been refreshed as well, with four new modes called Heist, Blood Money, Hotwire Mode and Rescue, all related to the police versus criminals setting. From what we’ve seen, it looks pretty fun, and the shift in focus is sure to breathe new life into the series. It’s set to release on March 17, 2015. Project CARS has been in development from a while, and ever since it has been revealed to the public, one word gets tossed around very often, ‘gorgeous’. Developed by British developer Slightly Mad Studios, Project CARS is a racing simulator featuring lifelike recreations of tracks and cars, down to the tiniest details. If you’ve been following its development, there are some jaw dropping real versus ingame videos that are almost indiscernible from each other. Funding and development was assisted by players via something called Tool Packs, and those who assisted in the development will be entitled to a portion of the game’s profits for 3 years. Whatever way you see it, that’s a sweet dead. It will be distributed by Namco Bandai Games and is set to release on March 17, 2015. Announced during E3 2013, The Division is a third person shooter developed by a triumvirate of studios under Ubisoft. It follows a specially assigned military group called the ‘Strategic Homeland Divison (SHD)’ or just ‘The Division’, established to combat threats caused by a virus that brought down the United States. Players are pitted against AI controlled units and other players in a massively multiplayer online situation, and are equipped with futuristic weapons and gadgets. Another unique feature is how players on tablets can control drones to assist players on consoles and PC. It looks fantastic, runs on the custom Snowdrop engine designed for next generation consoles, and from what we’ve seen, plays well too. A release date hasn’t been announced yet, but it should release in 2015. The fourth installment in the highly acclaimed Batman Arkham series is also set to release on June 2, 2015. It marks the return of original developer Rocksteady Studios, and continues the story from Batman: Arkham City. Batman fans will be happy to know that series veteran Kevin Conroy will reprise his role as the caped crusader too! Arkham Knight is set one year after the events of Arkham City, where Scarecrow is looking to end the Dark Knight once and for all by uniting all his enemies. There’s also a mysterious new villain called the Arkham Knight, who looks like a technologically superior and militarized version of Batman. The Arkham Knight is an entirely new character created for the game series. Gotham City from this iteration of the series is said to be 5 times larger than the area playable in Arkham City. Considering the track record of these games, we can’t help but be excited! It may not be a huge title and probably won’t get as much press as some of the other games on this list, but damned if doesn’t hold nostalgic value for a huge chunk of PC gamers. RollerCoaster Tycoon World is the fourth game in the park management videogame series, and is exclusive to PC. It will be the first to feature multiplayer and ‘Park Pulse’, a new way to see what visitors think of your park. Similar to RollerCoaster Tycoon 3, it will feature 3D graphics and will let players ‘ride’ the rollercoasters in either first or third person view as well. Apart from the quintessential rollercoasters, there will be a host of new rides and attractions, and a much more efficient management system. If you’re an old school gamer, RollerCoaster Tycoon should be at the top of your to-buy list the next year! Think of RPGs and the one of the first words that comes to mind is BioWare. The genre stalwarts announced a brand new IP called Shadow Realms after a cryptic marketing campaign, and boy does it look good! Shadow Realms hasn’t got a concrete release date yet, but we can’t help but be hopeful of a 2015 release. It’s set in both modern day Earth and a parallel magical world called Embra, where players take part in a war against a malefic enemy called the Shadow Legion. Similar to Evolve, it also features a 4v1 scenario where players can choose to be either part of the band of 4 Heroes with different classes and abilities, or the 1 powerful Shadowlord. The environment, missions and world are all dynamic, and will change according to updated content. Sounds cool, doesn’t it? 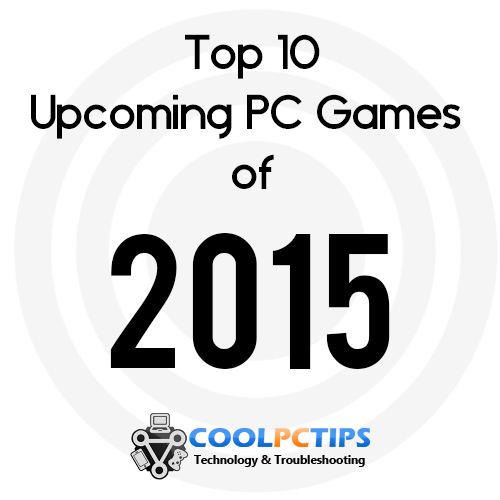 So those were our picks for the top 10 upcoming PC games of 2015, got any suggestions or questions? Think another game deserves a spot on our list? Do let us know via the comments below!